We are now distributing a limited range of the well-known kits from Electronic Rainbow. Please note that our minimum order on credit card purchases is $10.00. Learn to send Morse code! Build this easy little kit and learn to send Morse code! It's an LM555 timer-based code practice oscillator or "beeper." Easy to build kit is complete with printed circuit board, all parts including off-board speaker and battery clip , schematic, and instructions. All you need to add is a battery and an inexpensive telegraph key-- e.g. the AMECO K-1 or K-4. Power requirement +9VDC, size 2.5" x 1.5"
Build the Rainbow Active Antenna kit, extend the included whip antenna, and connect the equivalent of a 60' wire antenna. Amplifies signals on HF, VHF and short wave, with effective gain from 1MHz to 100MHz. Features RCA phono jacks for connection to receiver and (optional) external antenna and has a front-panel gain control. This is the "board kit" version and the optional enclosure is no longer available. Power requirement +9VDC or use a 7-15VDC wall transformer. 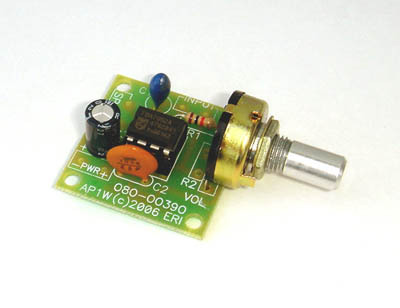 Board size 4.2" x 4.6"
See also the AMECO TPA tuneable preamplifier and active antenna. 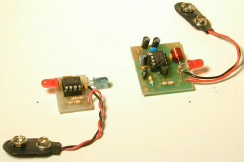 This kit teaches how stereo amplifiers take a small signal and "magnify" it to drive two small speakers or stereo headphones. It's based on two LM386 Low Voltage Power Amplifier and one LM1458 operational amplifier IC. This kit gives you a good quality Stereo Amplifier. You can use it as an intercom, a booster amp for portable CD players, or in your robot. You can also use it to add sound effects for plays or practical jokes. 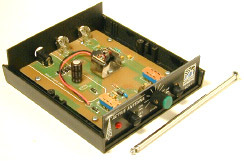 Power requirement is 5 to 10v DC, size 2.25" x 2.75"
This amplifier will operate from 3 Volts. It makes a perfect companion for your portable audio player. 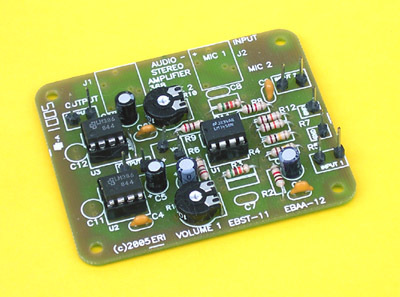 This amplifier will provide up to 1.2 Watts output power. Complete with a volume control. This will work great on any project where you need to amplify an audio signal. You supply an 8 ohm speaker or headphones for output. Power requirement: 3 to 18v DC. Printed Circuit Board Size: 1.15" x 1.15"
Sine waves are "pure" audio tones typically used to test audio equipment. This audio oscillator kit produces sine wave audio signals. Output amplitude and frequency are adjustable. You can use this kit to learn the "signal injection" method of audio-circuit troubleshooting The manual gives a lot of detail about the operation of the circuit (it's a Wien Bridge Oscillator using an LM1458 op-amp) and detailed roubleshooting instructions. The EBAO-3 will come up with a range of around 400-500Hz depending on component tolerances, but insructions are included for changing the range. Power requirement +9 VDC, size 2.25" x 2.75"
Check battery status at a glance! You can build this kit to monitor 5, 8, or 12V DC power supplies (optional parts supplied) and you can set the LEDs to indicate .25, .5, or 1V steps. SIZE: 1.3" x 2.7". Current usage depends on the voltage and the number of LEDs lit (typical 80mA at 12V) but you can easily add a pushbutton switch on the input-- push and check! For calibration, the VM-2 lot requires a DVM like our inexpensive MX-DVM2. Check AC line voltage status at a glance! You can build this kit to monitor the AC line voltage in your home, computer room or workshop. By default, the LEDs indicate 100, 105, 111. 118, 123, 128, and 132VAC. 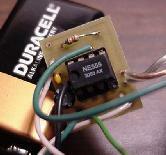 Operation requires a linear, un-regulated 12VDC transformer like our AM-P12T. For calibration, the VM-110 requires a DVM like our inexpensive MX-DVM2. These are just great for a "simulated burglar alarm" and to dress up kids' toys, and probably other uses we haven't thought of. The LEDs flash alternately. The MB-3 kit includes two yellow, two red, and two green LEDs so you can choose your own "style;" while the RB-3 contains two BIG (5mm) red LEDs. And at this price, you need two! Power requirement 9 to 12v DC. SIZE: .75" x 1"
These Jumbo LEDs are great for signs or as attention getters. 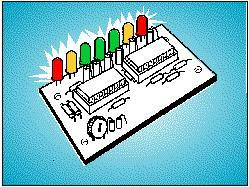 The kit includes 2 Jumbo (10mm) alternate flashing LEDs, in your choice of red or green. 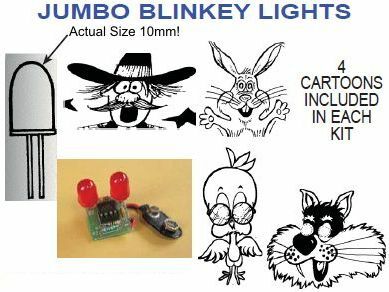 The kit includes the four printed cartoons shown, which slip over the LEDs for a comic effect. Use sound to turn something on or off. Or on and off! 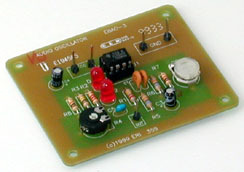 This VOX circuit can be used to control a radio, tape recorder, or alarm. With 100mA output the VOX-1 will operate many devices directly, or add a relay or power transistor to handle higher current applications. Circuit board size is 1.5 x 3" and the circuit requires 7.5 to 18VDC. This two-board kit transmists a modulated 40KHz IR signal to a distance of 6 to 8 feet. Use it for a door alarm, or to turn things on and off by remote control. 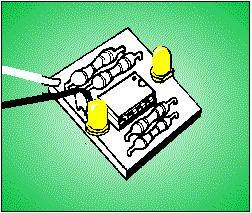 The output can be configured for normally on or normally off operation. You can also use it to test IR remote controls. It runs on 6-12VDC and the transmitter and receiver boards measure 1 x .75" anmd 1.4 x 1.2" respectively.